As moms, the voice in our head isn’t always our biggest supporters. How can we get through the tough moments, particularly the sensory meltdowns? 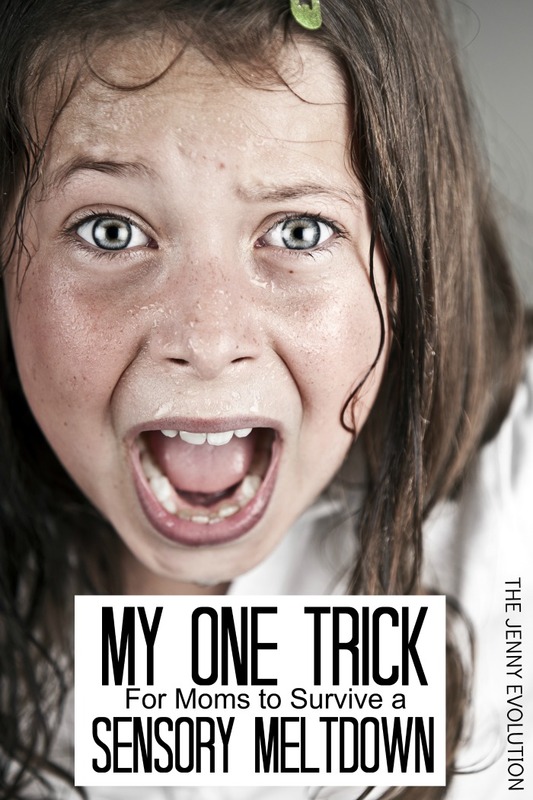 Today I am sharing my one secret trick that has carried me through each and every sensory meltdown my boys have thrown at me. Anyone who is a parent has dealt with a meltdown or two in their lifetime. But parents who don’t have sensory kids or children on the Autism spectrum can’t really understand what it’s like to have a child who is having an honest to goodness sensory meltdown. This isn’t a slight against any parent. It’s just a fact. Trust me. I’ve seen and experienced my share of severe tantrums. But a sensory meltdown is a whole different ball game. I was recently visiting my folks, standing in the guest bathroom, and had a flashback to a particularly memorable meltdown my son had while we were visiting. At this point in my life, I don’t remember what set off the meltdown. The sad thing it was one of hundreds upon hundreds of meltdowns my son has had over the course of his nine years. What made it memorable was it was the first severe one my parents witnessed and it was the meltdown that helped my parents truly understand what my husband and I were dealing with on a daily basis. It was the meltdown that helped my parents truly understand what my husband and I were dealing with on a daily basis. During a meltdown, a child doesn’t actually register their environment. They are not mad about not getting the toy or being denied ice cream. They are not due for a nap or acting “like a brat.” They are having such a visceral reaction to their environment, they are sent to a place that is either fight or flight, and their body enters into extreme fight mode. The thing is that while you are looking at your child melting down, you can look into their eyes and see that they are not really there. They are so deep down the rabbit’s hole that nothing you say or do will register. On this particular day, I was getting Vman was getting out of the bathtub, and I could see him spiraling down. Before I knew it, he was in full blown meltdown. At this point of our journey, I already knew I had to ride the wave out. With him arms flailing and legs kicking, I held him tight. Tight compression was my best chance of helping him settle down faster. I also was afraid of him hurting himself. At the time, I wasn’t worried about myself at all (even though he had broken my nose once). So we settled in on the furry bathroom mat. My mom, however, wanted to intervene. She’s a mom. She worries for me. And so, as any mom would, she tried to come into the bathroom to see what she could do. From my perspective and experience, her presence would have only added to the stress of the situation. She would have wanted to talk it out. She would have wanted to try to snap Vman out of it. She would not have recognized that the grandson she knows and loves was completely checked out. There is no reaching a child in a sensory meltdown. You just have to ride it out. And so, when she tried to enter the bathroom, I promptly kicked the door closed with my foot and yelled over Vman’s screaming to just let me handle it. I didn’t know at the time that she waited outside. I didn’t know at the time that she timed how long we were in there (well past 20 minutes). I do know that she was there when the tsunami had passed and I was thankful for her understanding and for respecting my own decision as a mom to keep her out. But I do know how I got through those meltdowns… and I’m going to tell you how. Let me take a step back first, though. I was in my mid 20s and working downtown at a ridiculously stressful public relations firm. I’ve never been one for working out, but somehow I got roped into a cardio kickboxing class and found it was one of the only stress relievers I had. This kickboxing class studio would hold upwards of 100 people. The sound of the class hooting and hollering was deafening. The pounding of the music even more so. I would show up early to that class to make sure I was going to be in the very front row. The instructor (a ridiculously gorgeous guy, which didn’t hurt) was more than happy to call you out if you were slacking. He knew everyone’s name. And he was the reason I came back to that class time and time again. It was the quotes he would repeat over and over that became a sort of mantra to get me through. It wasn’t his good looks (but, again, that didn’t hurt), it was what he said during the class. It was the words he said that reverberated in my head throughout the next day. It was the quotes he would repeat over and over that became a sort of mantra to get me through. And when I started having to manage Vman’s meltdowns, it was many of his words, morphed into my own, that became a mantra that helped carry me past the tsunami and into the clear. Much of riding the wave of a sensory meltdown is mental. Sure, it’s physically exhausting trying to keep your child from opening his skull on the nearest cabinet or wall. But it’s the mental challenge of sensory meltdowns that is so unbelievably exhausting. What I found during these meltdowns was I returned to many of the words my old cardio kickboxing instructor used to say, peppered with my own one sentence affirmations to get through. I’m sharing those one line affirmations with you. 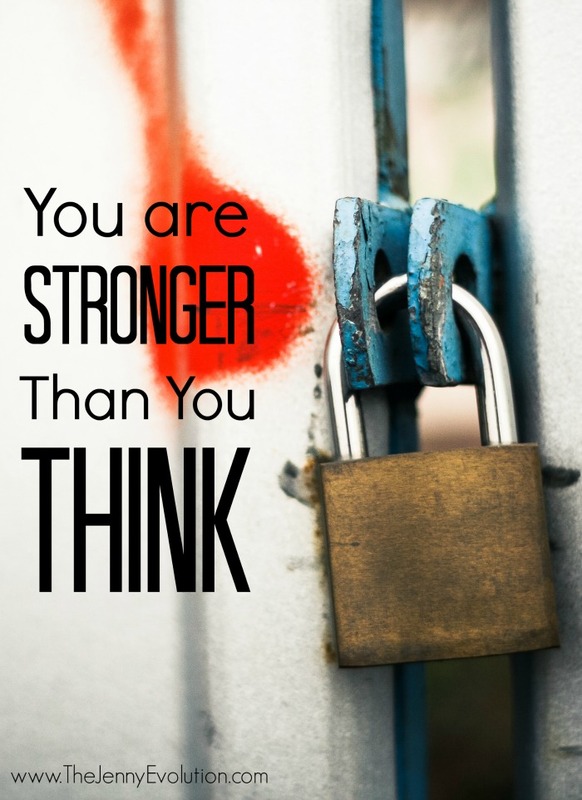 Because you know you’re tougher than you give yourself credit for. Just because you’re exhausted after a meltdown, even feel like crying, doesn’t mean you aren’t one tough broad. You have the power to get through those meltdowns. You aren’t walking away. If anything, you’re walking into the fire! Don’t you see how amazing that is?!? It’s time to start giving yourself credit where credit is due. No, you don’t do everything perfectly. No one is supposed to. But the fact is you stay in the fight. You are fighting for your child each and every day. Even though your body is fatigued and your soul is ready for a vacation, you have the heart of a lioness. Don’t forget that. During your child’s next sensory meltdown, repeat these one line affirmations to carry you through. Before you know it, they will become your own unsung mantra, sprinkled in with your own affirmations. I hope you add some to the comments section of this post. 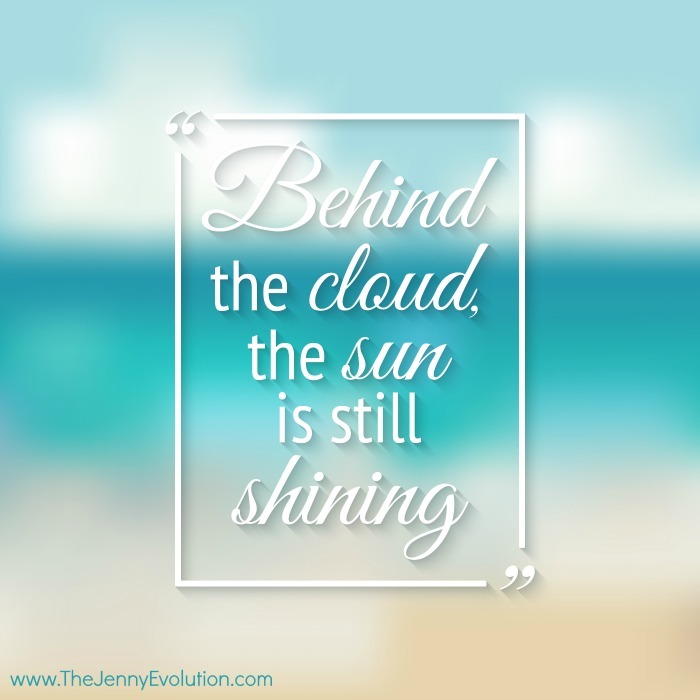 Behind the cloud, the sun is still shining. 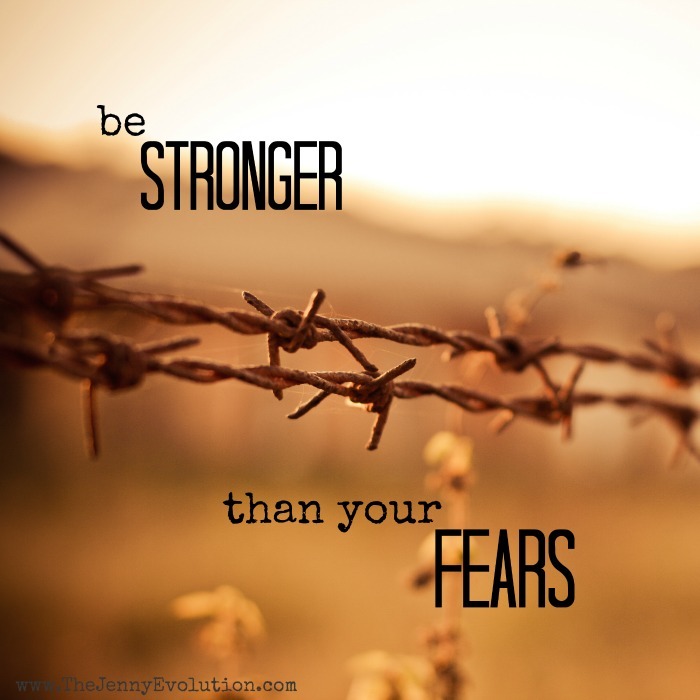 Be stronger than your fears. Do you have any one line affirmations you use in your life? Share in the comments! Girl? Did you just pull this out of a hat overnight????? Dang. I think you know I’m on the spectrum too and I actually has a massive stress induced meltdown last week and I rember saying to my dh, over and over, “I’m not sad, I’m not angry, it’s just my body and brain are hurting!! !” Whew! So I need these affirmations for myself And my sensory son and my prone-to-tantrums daughter!!!! 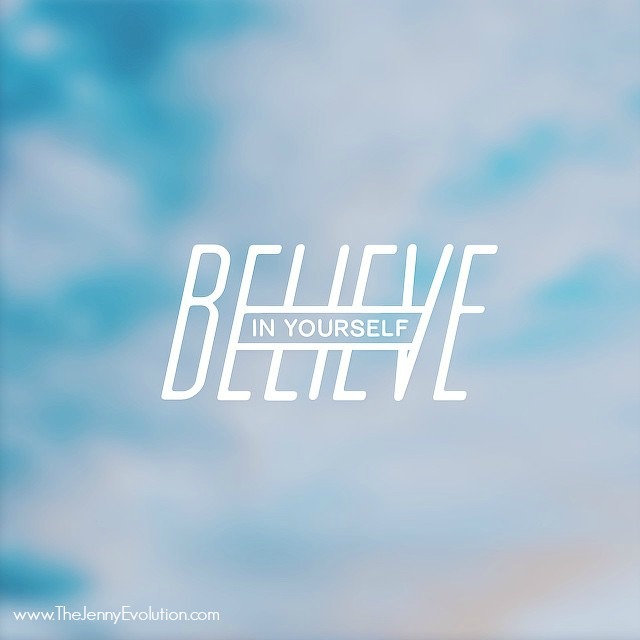 The graphics are the part that took a little while and kept me up to complete 🙂 I hope you pick up a couple of new affirmations…. they get me through a whole lot more than just meltdowns somedays! 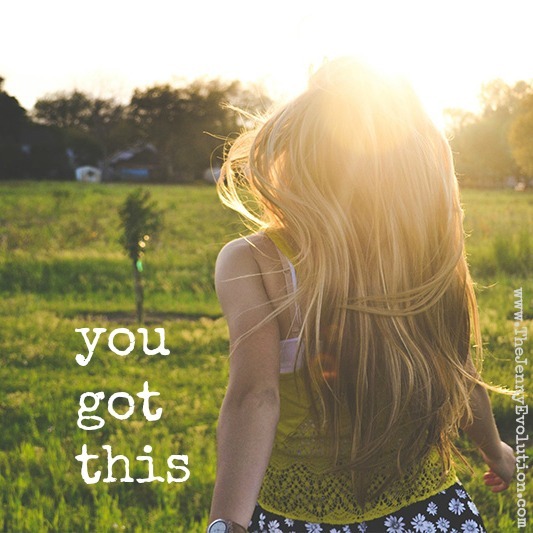 Yes, just keep telling yourself you got this! 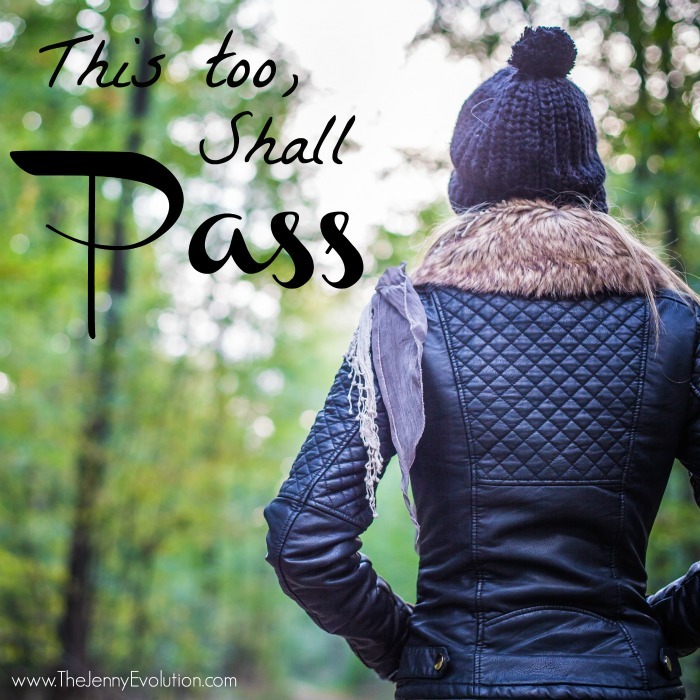 “This, too, Shall Pass” is what I tell myself – during each stage, and each rage. If I had a nickel for every time I told myself “This too shall pass” I’d be a rich woman! Wow, did I ever need to hear this today! Not so much for my son, but for myself. So much of life in general is how we approach it mentally, isn’t it? I agree with FSM, one of your best posts yet! Thank you. Life is definitely all about mental attitude. It doesn’t mean we have to pretend everything is coming up roses. But we always need to find a way to psych ourselves up. And my husband and I strongly believe the worst days we’ve ever had were the days we didn’t find something… no matter how small… to laugh about. These are great! My personal mantra is “I’m doing the best I can in a difficult situation.” I find one-liners are super helpful. During my daughter’s meltdowns it seems like time stands still. 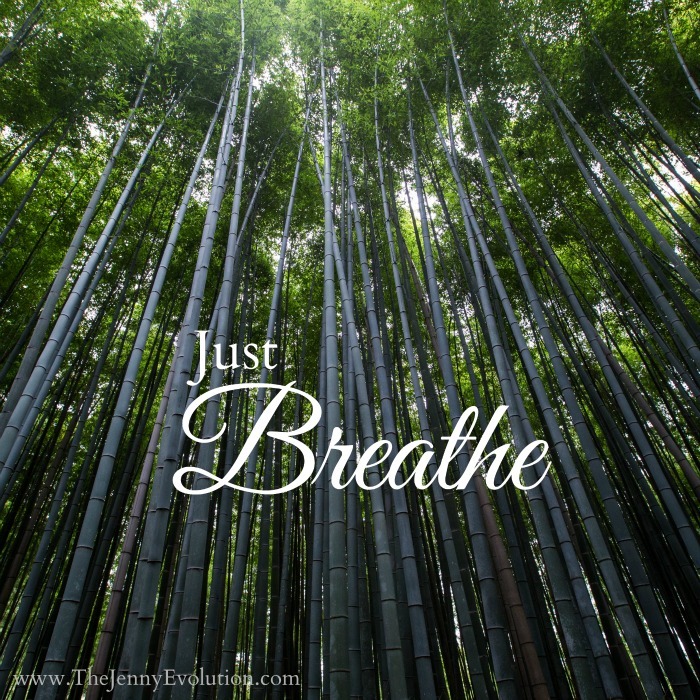 Just breathe has helped me through quite a few. Yes… time does stand still! And yes, I often felt like these meltdowns lasted for hours at the same time. My son is now 17 years old but when he was younger, he was diagnosed with Sensory Integration Disorder. At the time, little was known about it and I wasn’t sure what exactly was going on. After several years of Occupational Therapy, I learned how to better handle his meltdowns. Hugging tightly definitely helped. So did rubbing his body with a rough washrag. There were times, when hugging him tightly, that people would stare or make remarks that I was abusing my child. I felt so helpless and exhausted after some of his meltdowns. Your quotes are encouraging to those out there dealing with Sensory Integration Disorder. I can say that after several years, my son has pretty much outgrown the disorder and can now function without going into a tizzy when in large crowds or noisy places. That’s wonderful to hear your son is doing so much better. My personal experience has been that kids don’t necessarily grow out of Sensory Processing Disorder but come up with their own coping skills to manage the situation as best they can. Gosh, you said that beautifully. Meltdowns are my worst, and people trying to help is just not helpful. But their intentions were good. My daughter has some hum-dingers. I always feel hurt and like such a failure, and totally depleted after the tornado. And then she turns around and squeezes me as the fight leaves her. She hates her meltdowns too, and also feels depleted. I’m going to start using these affirmations, and teach them to her. Metldowns leave us ALL exhausted. And our kids definitely hate their meltdowns as much as we do for sure! Thanks. This article made me cry like a baby. I really needed to read this today. I think the one liners are going to help me. I’m just learning about SPD and reading to know more about it to see if this is something my daughter has. 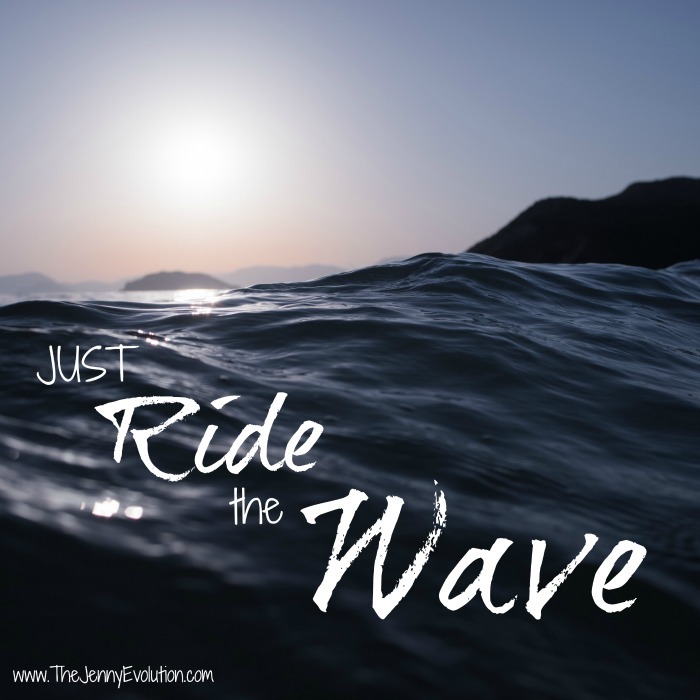 So, what did you do while you were just riding the wave? Did you just hug him until it ended? Yes, that’s exactly what I do. The hugging acts as compressions for my kiddo, which helps calm him. But nothing happens quickly when a kid is in meltdown mode. The mantras really have made such a difference for me… and now I use them all the time, not just during meltdown mode. I’ve found they help me keep perspective and stay calmer than I actually feel at the moment. I REALLY needed to read this. There are important people to me that just don’t understand and underestimate my work as a mom, and trying to educate my husband about our moderate SPDer son, and trying to cut off our “traditional” parenting to a gentle and respectful one… Sometimes is exhausting! Thank you for writing it! Let’s keep stronger! Great article, thank you! My son has Sensory Processing Disorder along with other issues on the Autism spectrum. He is what they consider “high functioning” but the meltdowns just break my heart. We have been told not to touch him in the midst of a meltdown (unless he might hurt himself) because the touch feels like pain to him at that point and ratchets up his stress. We have noticed that they are shorter if we don’t touch him which is unbelievably difficult when you just want to comfort your child. I always described it as him standing in the eye of a hurricane while his emotions rage out of control. Sometimes I get a peek of him through the madness and he is absolutely terrified/horrified by what is happening because he has no control over it. This article explains well what I have been trying to explain to others! I think it’s especially tough when your child is a tactile avoider. My kiddo is… but he did better with deep compressions than without. 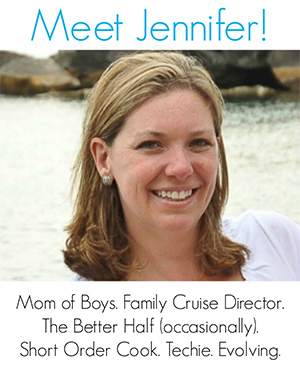 You have to figure out what works best for your kiddo despite what our instincts are and you’ve definitely done that. Not an easy task, to say the least! Thank you so much. My son is 3 and just diagnosed and we are just starting to deal with this. I already recognise that look in his eyes and I know worse is to come as he gets older. I feel it in my bones. Excellent post. I would start working on helping your child with his specific sensory needs. Pediatric occupational therapy was key for us. It doesn’t happen over night… but it does help. “My child is not giving me a hard time. I also look at him and think, as bad as it is to watch him go through this, it must be so much worse to be the one going through it. If I can stay in that place of compassion it is so much easier to ride it out and stay calm. I say that a lot, too. But just during the daily struggles because that’s when I’m most likely to lose my cool. And yes, as hard as it is for us to go through the meltdowns, it must be that much harder for our kids. My favourite part is “Even though your body is fatigued and your soul is ready for a vacation, you have the heart of a lioness.” I think that’s true of all mothers, but those of us with autistic children are among the most tested! I think we often discount how strong we are…. but even when you’re feeling lost and meek, you always have the heart of a lioness! “It is what it is” helps me get through a lot. It reminds me that I don’t have to like it but being stressed or angry only makes it worse. I also started using it with my boys to calm them and it’s helped calm many situations. Jen.. I use that all the time, too! 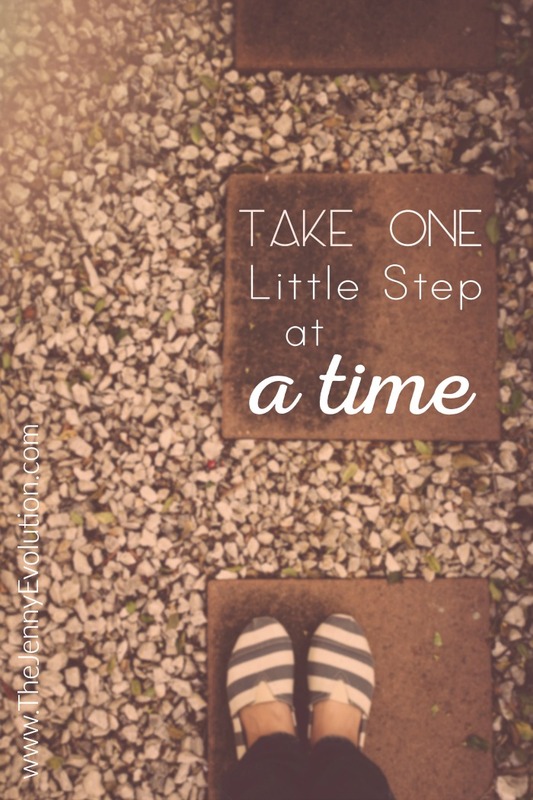 Not during meltdowns… but when I’m feeling discouraged, I just embrace the fact that that’s the way it is right now. Love this so much! Such great affirmations! It is completely mental- and figuring that out takes awhile and is the hardest part I think! It helps so much to have something to else focus on, because it’s so easy to get emotionally invested- which doesn’t help matters at all! Thank you for posting this! This will be very helpful for me, handling my two boys that are autism. From St. Julian: All shall be well and all shall be well and all manner of thing shall be well. It doesn’t matter what passerbys think or say. I know my child. Just found your page and am crying ugly tears after reading this. Literally just got through a meltdown 20 minutes ago and I’m sitting in the parental shame that always follows afterwards. I feel like such a failure as a mom- we’ve just had such a rough few weeks despite consistently going to OT and integrating new techniques at home. My question is- my three year old son bites, scratches, hits, etc. during his meltdowns as it sounds like a lot of our kiddos do. But hugging him doesn’t help- it usually just means a bleeding scratch wound for me or a head bang to the face.. Does anyone have any other techniques to try for a kiddo that is phaycially lashing out during a meltdown? Another way to hold him so he’s safe and I am too? I want to hug him, but when he’s in that place he usually ends up hurting me (it’s crazy how strong a three year old can be.) Thanks for reading and any suggestions would be so appreciated. I have learnt to follow my child’s ques. If she is lashing out, running away from me, flinching at the slightest touch I do not try to hug her. I always try to get her to her room if at all possible (sometimes that means picking her up upside down which calms her some and carrying her to her room) and close the door. I sit down inside the room, blocking her only exit, without making eye contact or speaking, sometimes barely breathing, until it has passed. Almost always she will crawl into my lap and sit there under her weighted blanket, refusing to get up. This is actually the hardest part to deal with! It is in these moments that I can sense her distress, self loathing and uncertainty… Dealing with these emotions and building her up again takes a lot more effort than surviving a meltdown. Hang in there Kelsey! It did improve with therapy! I needed this so bad today. As I sit her rocking my little one after huge meltdown that left my kitchen splattered with tomato soup, I’m crying ugly tears trying to get myself in a space where I’m ok again. It’s good to know we are not alone. my mom also kept trying to talk to my little one during meltdowns which made them so much worse. One day we were in Wal-Mart and had the grand Daddy of all meltdowns and my mom finally got it. Now she is way more supportive and understanding. Yep… why does it take the mega meltdowns for our folks to finally get it! Glad to hear she’s on board now though. OMG! I don’t believe in fate or destiny, but God, and he led me right to your site! My son is 3 (will be 4 in November) and I have spent the last 3+ years asking God what I have done wrong or why I am such a bad mom. Finally, after one of the worst meltdowns in my son’s short life (it happened on vacation while trying to cross a busy intersection in D.C.), I made an appointment with my pediatrician. She referred me to a place that will test and evaluate him. They initially told me they would not have any appointments until December/January, then called back to tell me they had a unexpected cancellation and can I come in just 3 days from now! Again, God is amazing! Anyway, after reading and reading through your posts, I know they are going to find he has SPD! He too hates coats and pants (we also live where it will be cold soon), he hates showers, he can’t transition well from one thing to the next, his socks have to be just right or he takes them off immediately… I could go on! It just makes me feel that I have not done anything wrong and I am not a bad mom. I just need to learn the strategies to help him. Thank you so much for sharing your life with SPD! My daughter is grown now but I remember going through meltdowns like that. We didn’t know she had SPD. The school kept saying they’ve never seen anything like it. I did my research and finally figured it out. Thank Jesus for the OT in the school! My daughter gradually figured out what would help her calm herself down. It took a lot of hard work and praying but she matured and has a job. Hang in there, believe in your child, and take care of yourself through it all. I ended up becoming a Special Education teacher because of all this.